« He must love me so much to imagine me like that ! », exclaimed Catherine Deneuve, one of the demoiselles de Rochefort in the film by Jacques Demy, on discovering her portrait done by Maxence, a young sailor who had never seen her. There is not a jazz club in the world where the famous Chanson de Maxence is not standard fare, though perhaps under its English title, You must believe in spring, later interpreted by pianist Bill Evans. But who in fact composed such a catchy tune ? Michel Legrand, of course. And the same goes for the Chanson des jumelles for which we were inspired by a new, more incisive arrangement put together by French singer song-writer Essaï. And how Claude Nougaro loved his little Cécile. The melody of this beautiful ballad, accompanied by the brushes of Jean-Pierre Jackson, our invited drummer, is instantly recognised by one and all. Just like the Pas, a swaying bossa nova in which Elsy Fleriag’s voice instils a Creole flavour that takes us immediately to her native Martinique and to the Brazil loved by Claude. Need anything be said about Rimes, composed by Aldo Romano using a curious, five-beat rhythm quite unusual for our western ears ? 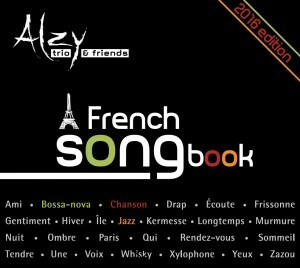 It is therefore with a wink and a nod that we included an English-language title in this very Frenchy album from the Alzy Trio. A hat tip to the Great American Songbook that is chock full of Broadway standards from Ellington and Gershwin, played by all jazz(wo)men worldwide. A tribute from the grand repertoire of French songs that have also been adopted by musicians everywhere. Un été stands out as well because it was composed by the Italian pianist Bruno Martino. In it, Claude Nougaro tells us a tender child’s story. He had so hoped to see « jazz and java as friends, that should be possible ». Unfortunately, Nougaro and Gainsbourg never recorded anything together, but does anyone doubt that La javanaise written by Serge could one day have brought them together in order to « give my hands to java and place them in the small of her back ». It is now a duo that I sing with our guest, Tamanga Bévis, backed by a guitar solo by Thierry and a wonderful harmony by Christian. A great piece of music that also benefited from the arranging talents of Quebecoise singer Térez Montcalm and guitarist Yann Viet, who inspired our version. Finally, Tu verras, composed by Chico Buarque from Brazil, is the last piece on the CD and leaves us with a wonderful promise of « inventing love for you from the depths of my arms, until the birth of a new morning ».